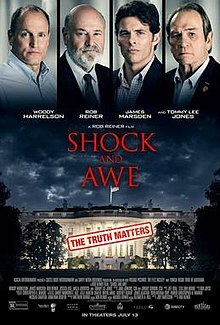 Shock and Awe is a 2017 American drama film directed by Rob Reiner and written by Joey Hartstone. The film stars Woody Harrelson, Tommy Lee Jones, James Marsden, Milla Jovovich, and Jessica Biel, and follows a group of journalists at Knight Ridder's Washington Bureau who investigate the reasons behind the Bush Administration's 2003 invasion of Iraq. The film had its world premiere at the Zurich Film Festival on September 30, 2017 and was released through DirecTV Cinema on June 14, 2018, before having a limited release on July 13, 2018, by Vertical Entertainment. Journalists investigate the assertions by the Bush Administration concerning Saddam Hussein’s alleged possession of weapons of mass destruction as an excuse for the 2003 invasion of Iraq. Most of the administration’s case for that war made absolutely no sense, specifically the notion that Saddam Hussein was allied with Osama bin Laden. That one from the get-go rang all the bells — a secular Arab dictator allied with a radical Islamist whose goal was to overthrow secular dictators and reestablish his Caliphate? The more we examined it, the more it stank. The second thing was rather than relying entirely on people of high rank with household names as sources, we had sources who were not political appointees. One of the things that has gone very wrong in Washington journalism is ‘source addiction,’ ‘access addiction,’ and the idea that in order to maintain access to people in the White House or vice president’s office or high up in a department, you have to dance to their tune. That’s not what journalism is about. We had better sources than she (Judith Miller) did and we knew who her sources were. They were political appointees who were making a political case. I first met him (Ahmed Chalabi) in '95 or '96. I wouldn’t get dressed in the morning based on what he told me the weather was, let alone go to war. Knight Ridder Washington reporters Warren Strobel and Jonathan Landay received the Raymond Clapper Memorial award from the Senate Press Gallery on February 5, 2004 for their coverage of the questionable intelligence used to justify war with Iraq. On July 12, 2016, Woody Harrelson was added to the cast of Iraq war film Shock and Awe. On July 13, 2016, James Marsden also joined the film. Principal photography on the film began in Louisiana on October 5, 2016. In October 2016, Alec Baldwin left the production reportedly due to financial timing. In November 2016, filming also took place in Washington, D.C.
Walcott has said he believed the film to be essentially word for word. At a point in the film, Walcott gives an inspiring speech to the newsroom, but the original script had a screenwriter's version. On the day of shooting, Strobel said to Reiner that he should use Walcott's original words; Reiner had Walcott write down his exact speech, and Reiner then filmed the scene. The film had its world premiere at the Zurich Film Festival on September 30, 2017. Shortly after, Vertical Entertainment and DirecTV Cinema acquired distribution rights to the film. The film was released through DirecTV Cinema on June 14, 2018, before being released in a limited release on July 13, 2018. On review aggregator website Rotten Tomatoes, the film holds an approval rating of 29% based on 49 reviews, with a weighted average of 4.69/10. The site's critical consensus reads, "Shock and Awe has a worthy story to tell and some fine actors trying to bring it to life; unfortunately, the end results are still as derivative as they are dramatically inert." On Metacritic, the film has a weighted average score of 47 out of 100, based on 18 critics, indicating "mixed or average reviews". Writing for Rolling Stone, David Fear gave the film 2/5 stars, saying, "It's an important story to remember right now, assuming you can remember anything after being beaten over the head with talking points for 90 minutes. But at its best, Shock and Awe still feels like it strains to be Spotlight-lite and comes up lacking. The title is a misnomer." Kerry Lengel of The Arizona Republic gave the film 1.5 out of 5 stars, writing: "All of this might be forgivable if Shock and Awe weren't such a terrible movie. It's trite and mechanistic in its attempts to build pathos while also making its arguments, from the opening scene featuring a soldier paralyzed by an IED to the absolute low point, a date between Marsden's reporter and his pretty next-door neighbor, played by Jessica Biel." Deborah Young of The Hollywood Reporter wrote, "The reporting team at Knight Ridder Newspapers has been called 'the only ones who got it right' about Saddam Hussein's non-existent weapons of mass destruction that sparked the 2003 Iraq war. Based on a true story, Rob Reiner's Shock and Awe gives much-deserved credit to their far-sighted (if generally unheeded) news coverage, but the message tends to melt into a paint-by-numbers screenplay that pushes too many genre buttons to be thoroughly exciting." ^ "Hollywood comes to Marksville". marksvilletoday.com. August 14, 2017. Retrieved August 5, 2018. ^ "Tunica-Biloxi Tribe's third movie set for summer release". avoyellestoday.com. April 14, 2018. Retrieved August 5, 2018. ^ "Acacia Entertainment". tunicabiloxi.org. December 2, 2016. Retrieved August 5, 2018. ^ "Shock and Awe (2018)". Box Office Mojo. Retrieved July 25, 2018. ^ "Bill Moyers Journal . Transcripts - PBS". www.pbs.org. Retrieved August 5, 2018. ^ Follmer, Max (March 28, 2008). "The Reporting Team That Got Iraq Right". Retrieved August 5, 2018 – via Huff Post. ^ "Zurich: Rob Reiner's 'Shock and Awe' Gets Standing Ovation". hollywoodreporter.com. Retrieved August 5, 2018. ^ McNary, Dave (July 12, 2016). "Woody Harrelson in Talks for Iraq War Drama 'Shock and Awe'". Variety. Penske Business Media. Retrieved January 11, 2017. ^ "Iraq war 10th anniversary: A dark mark for news media". latimes.com. March 19, 2013. Retrieved August 5, 2018. ^ "American Journalism Review". ajrarchive.org. Retrieved August 5, 2018. ^ "Knight Ridder journalists honored for stories on war planning". mcclatchydc.com. Retrieved August 5, 2018. ^ "Iraq-Coverage Awards for KR, UPI – Editor & Publisher". www.editorandpublisher.com. Retrieved August 5, 2018. ^ "Office of International Affairs - Jonathan Landay". oia.osu.edu. Retrieved August 5, 2018. ^ "CNN.com - Transcripts". www.cnn.com. Retrieved August 5, 2018. ^ "Iraq: Where were the journalists?". cnn.com. Retrieved August 5, 2018. ^ "Knight-Ridder Scores (Again)". cjr.org. Retrieved August 5, 2018. ^ "Wrong on Iraq? Not Everyone". fair.org. April 1, 2006. Retrieved August 5, 2018. ^ "Warren Strobel - C-SPAN.org". www.c-span.org. Retrieved August 5, 2018. ^ "How Walcott and the Knight Ridder reporters went about their work". niemanwatchdog.org. Retrieved August 5, 2018. ^ "John Walcott - National Press Foundation". nationalpress.org. Retrieved August 5, 2018. ^ "Wayback Machine". archive.org. August 5, 2018. Retrieved August 5, 2018. ^ "Peter Maass - Books - Love Thy Neighbor: A Story of War". www.petermaass.com. Retrieved August 5, 2018. ^ "Global Concepts & Communications - international consultancy with a conscience". gcc-alexandria.com. Retrieved August 5, 2018. ^ Landay, Vlatka (August 5, 2018). "Positioning Through Hate Speech: Immediate Effects and Lasting Consequences of Serbian Wartime Media Discourse". georgetown.edu. Retrieved August 5, 2018. ^ Jaafar, Ali (July 12, 2016). "Woody Harrelson To Reteam With Rob Reiner For Iraq War Pic 'Shock And Awe'". Deadline Hollywood. Penske Business Media. Retrieved July 12, 2016. ^ Jaafar, Ali (July 13, 2016). "James Marsden Joining Woody Harrelson In Rob Reiner's 'Shock And Awe'". Deadline Hollywood. Penske Business Media. Retrieved July 13, 2016. ^ King, Kevin P. (October 1, 2016). "Central Casting Louisiana *SHOCK & AWE - filming in Hammond, LA - Wed October 5th*". The Southern Casting Call. Archived from the original on October 18, 2016. Retrieved January 11, 2017. ^ Gerard, Jeremy; Busch, Anita (October 18, 2016). "Alec Baldwin Exits Rob Reiner's 'Shock And Awe'". Deadline Hollywood. Penske Business Media. Retrieved January 11, 2017. ^ Heil, Emily (November 14, 2016). "Star-studded Rob Reiner movie 'Shock and Awe' filming in D.C." The Washington Post. The Washington Post Company. Retrieved August 27, 2017. ^ Editorial, Reuters. "Reuters hosts private screening and roundtable discussion of "Shock..." reuters.com. Retrieved August 5, 2018. ^ "White House responds to Knight Ridder article". mcclatchydc.com. Retrieved August 5, 2018. ^ "Shock and Awe". Zurich Film Festival. Retrieved February 22, 2018. ^ Hipes, Patrick (February 22, 2018). "Rob Reiner's 'Shock And Awe' To Hit Theaters This Summer With Vertical & DirecTV Deal". Deadline Hollywood. Penske Business Media. Retrieved February 22, 2018. ^ Times Staff (April 26, 2018). "Every single movie coming out this summer". Los Angeles Times. Retrieved April 26, 2018. ^ Pederson, Erik (May 18, 2018). "'Shock And Awe' Trailer: Rob Reiner's Thriller About Journalists Vs. The Government's Iraq War Justification". Deadline Hollywood. Penske Business Media. Retrieved June 20, 2018. ^ "Shock and Awe (2018)". Rotten Tomatoes. Fandango Media. Retrieved March 1, 2019. ^ "Shock and Awe Reviews". Metacritic. CBS Interactive. Retrieved March 1, 2019. ^ Fear, David (July 13, 2018). "'Shock and Awe' Review: Journalistic Drama Is No 'All the President's Men". Rolling Stone. Retrieved July 18, 2018. ^ Lengel, Kerry (July 12, 2018). "'Shock and Awe' review: Thanks but no thanks to Rob Reiner's drama". The Arizona Republic. Retrieved July 18, 2018. ^ Deborah Young. "'Shock and Awe': Film Review - Dubai 2017". hollywoodreporter.com. Retrieved August 5, 2018. McClatchy DC (July 9, 2015). "Iraq Intelligence". Retrieved August 5, 2018 – via archive.org. This page was last edited on 2 March 2019, at 04:06 (UTC).